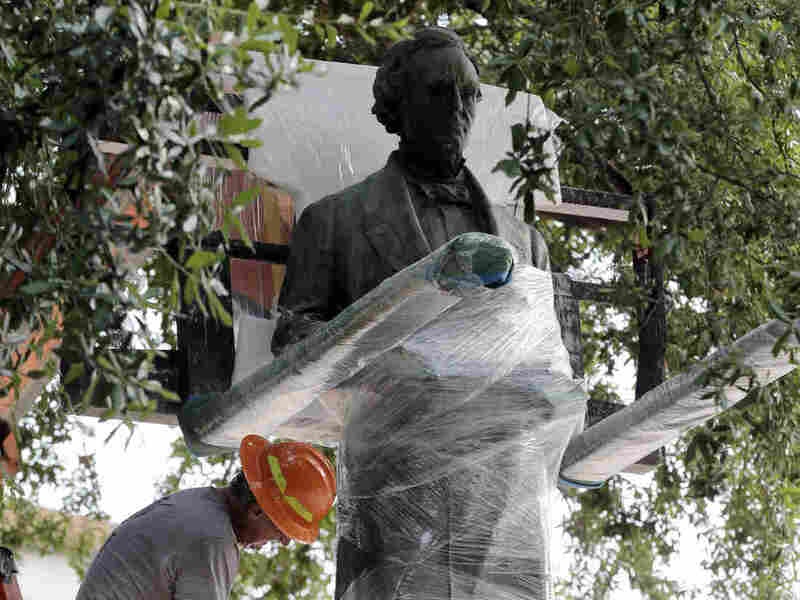 Jefferson Davis Statue Comes Down At University of Texas : The Two-Way The larger-than-life sculpture of the president of the Confederacy was removed after an appeal to block the move was rejected last week. Workers wrap protective materials around a statue of Confederate President Jefferson Davis as they prepare to move the sculpture on the University of Texas campus in Austin, on Sunday. A larger-than-life bronze statue of Jefferson Davis was taken down at the University of Texas today after standing on the South Mall of the campus since 1933, following a legal appeal to keep the controversial memorial in place was rejected. In addition to the statue of the president of the Confederacy being removed, a statue of U.S. President Woodrow Wilson is also being moved to another location on the Austin campus. In March, UT student government voted to remove the statue. The Austin-American Statesman reports: "The statues of Davis, who led the Confederacy, and Wilson, the nation's 28th president, will be refurbished before they are placed in new settings. The Davis statue will be installed in 18 months or so in UT's Briscoe Center for American History after the center is renovated, while Wilson's will be placed at a yet-to-be-decided outdoor location on campus, according to university officials." "Crews could be seen Sunday morning removing the statue of the Confederate president from its place near the university's iconic clock tower. "University President Greg Fenves recently said the statue would be moved to a museum." The statue had been a target of vandals who have criticized it as a symbol of racism, as Confederate symbols across the country have been reconsidered in the wake of June's mass shooting of members of the Emanuel African Methodist Episcopal Church in Charleston, South Carolina, by white supremacist Dylann Roof. A judge last week ruled against the Sons of Confederate Veterans, which sued to stop the university from moving it. Gregory Vincent, UT's Vice President for Diversity and Community, called the moment "iconic." "It really shows the power of student leadership," UT Vice President for Diversity and Community Gregory Vincent was quoted as saying by The Houston Chronicle. "Putting [the statue] in the Briscoe Center, far from whitewashing or erasing history, but puts it in the proper historical context," Vincent has said.